There are as many recipes for Welsh rarebit (also known as "Welsh rabbit") as there are Welshmen. Mine is a combination of several seemingly standard recipes: I begin with a fairly bland cheese sauce (roux to Béchamel to Mornay), to which I add salt and pepper. After some stirring, I add a blot of mustard and some beer—stout, in this case, given the part of the world that this dish comes from. 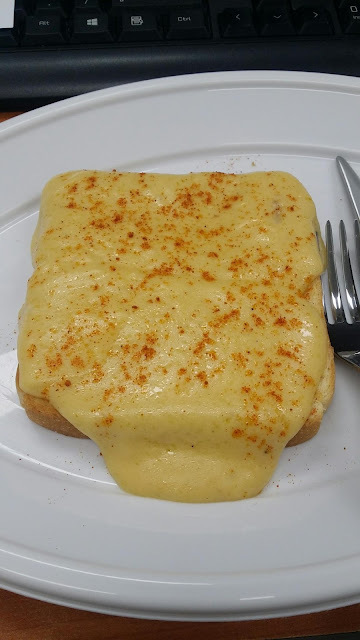 The dish is finished when the cheese sauce is ladled onto toast (there's some debate about whether to toast one or both sides of the bread) and sprinkled with—in this case—paprika. The result: everyone loved the rarebit, a poor-man's-food-done-good if ever there was one. Been ages since I've made this. Kind of want to do it again now, but I don't have any beer that I would want to toss in. And that's what happens when you become a 맥주phile. If the beer isn't being drunk, it's being wasted.